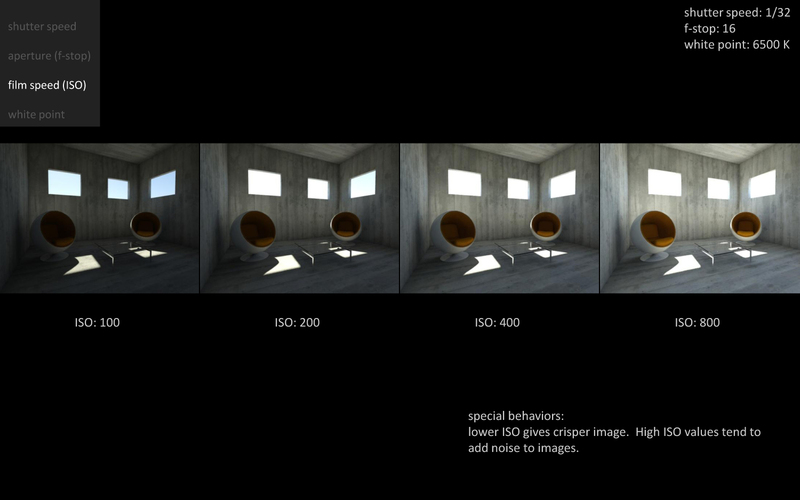 Last week I gave a presentation on photography for architecture, and thought this information would also be useful for exposure settings in 3D for renderings. 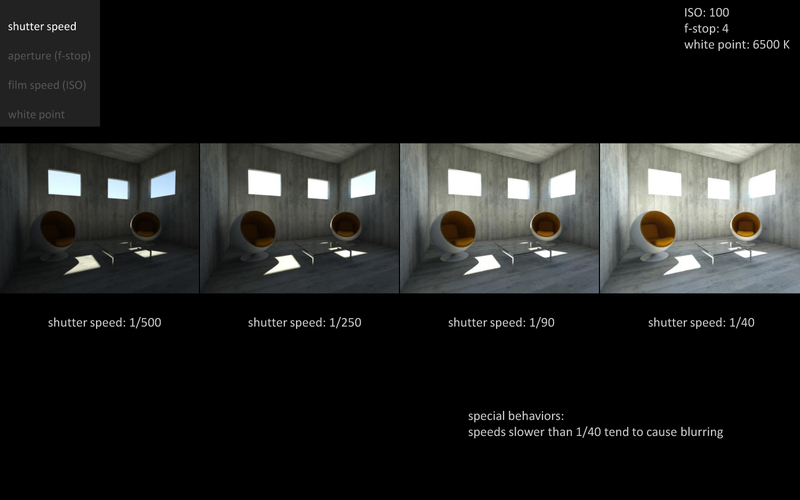 With mental ray, the values are almost identical to a real cameras settings. Understanding these settings can make it much easier to get the rendering quality that you want…and can also help you take better pictures with your camera! The shutter speed value determines how long the shutter is open in a camera. The longer it’s open, the brighter the image. Acceptable values are 500, 250, 30. The important thing to remember is these numbers are fractions of a second. So when you see 500, it’s really 1/500th’s of a second. So the smaller the number, the longer the exposure only up until you get to full second values. So it’s important to know your camera. If you see 30 it could be 1/30 of a second or it could be 30 seconds. Just play with the setting to see where you are. I’ve found that speeds slower than 1/30th of a second on my camera tend to cause blurring if I’m not using a tripod. The shutter speed is also what determines blurry people. If you want a crisp photo with blurry moving objects, use a tripod and leave your exposure open for 1 full second. The aperture is how wide the lens is open. This value is called f-stop, and the lower the value, the wider the aperture, the brighter the image. In reality the f-stop is a factor of the focal length. For example if you are using a zoom lens at 17mm, you could get your f-stop to be as low as 3.4…but with the same lens if you are zoomed in at 100mm, your f-stop value can only go so far to maybe 4.0. Depth-of-field (DOF) is also a factor of the f-stop number. Typically the lower the f-stop number, the more of a DOF effect you can get. Because we deal with exposure in 3D there is no limitation to the f-stop value. 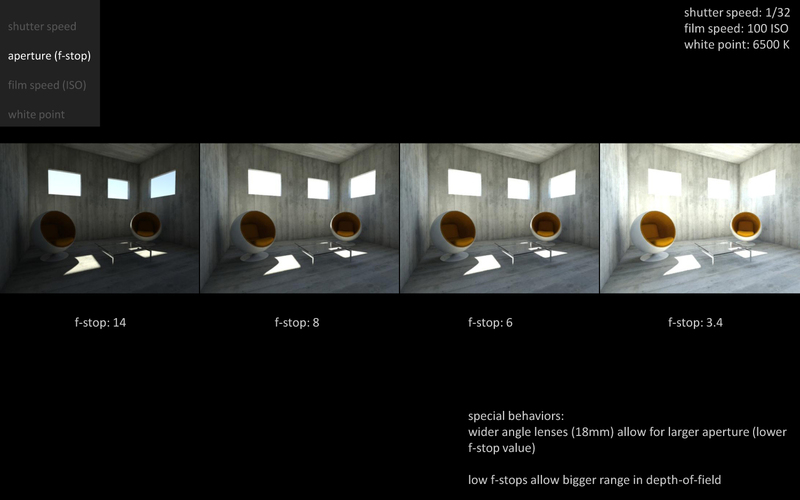 In mental ray, f-stop doesn’t affect DOF, whereas in v-ray, if you are using a v-ray camera, DOF is affected by f-stop. Traditionally before digital cameras, you had to choose what film to put in your camera and it had a fixed film speed (ISO) value. Higher values are more sensitive to light, but noisier; whereas lower speeds of film are less sensitive to light, but are sharper. Because a digital camera doesn’t use film, this value is purely fictitious and simply imitates what ISO used to be. The advantage to a digital camera, and renderings is that on the fly we can change the ISO value without having to change film. 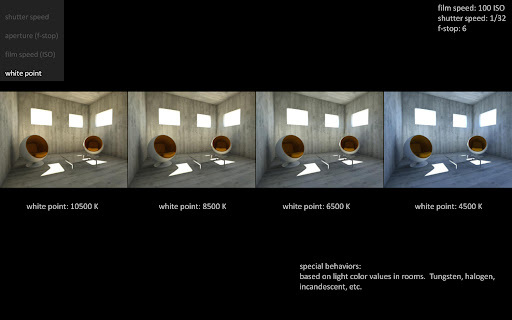 The difference between your digital camera and rendering though is that when you increase your ISO values in 3D, the rendering does not become more noisy.